I make at least two batches of muffins every week for quick on-the-go snacks for my three active children. Their favorite muffin is an old banana chocolate chip recipe with too much sugar and white flour. I have tweaked it over time but they notice every single subtle change and it is never the same favorite flavor as the original. 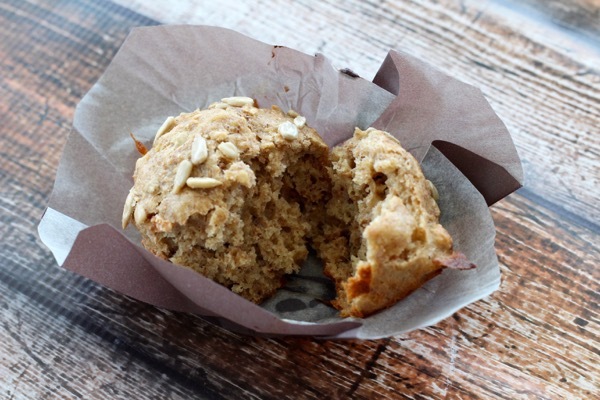 On my quest for a healthier muffin that the kids would actually enjoy and eat, this muffin recipe nails it. Even my older teenage boy approves, as evidenced by the empty cake stand a day after baking. 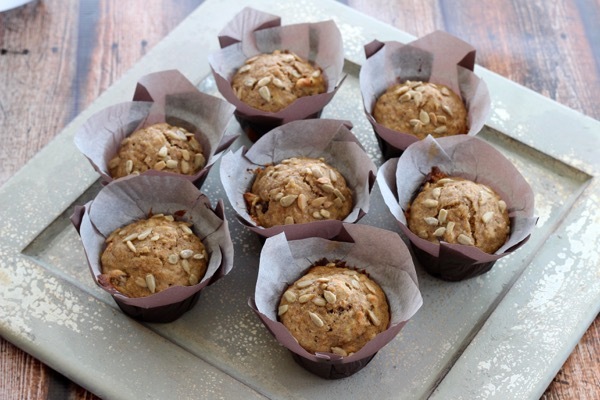 These muffins are made moist by the bananas and are sweetened by the maple syrup and a wee bit of honey. The maple is really not a prominent flavor but helps with the overall natural sweetening. The nuts add some crunch and texture and as you can see below, the muffins have a nice crumb. As with any muffin recipe any mix-ins can be added – dried cranberries, dried apricots, etc..
Bananas are used as the base of the muffin to add moisture and are one of the best sources of potassium – an essential mineral for maintaining normal blood pressure and heart function. Pastry flour is ground using the entire wheat berry (germ and bran still intact) and does not impart a strong “wheaty” or “tannic” flavor (like whole wheat). Wheat germ is packed with important B vitamins, such as folate, vitamin B1 (thiamin) and vitamin B6. Wheat germ is also high in vitamin E, an essential nutrient with antioxidant properties. 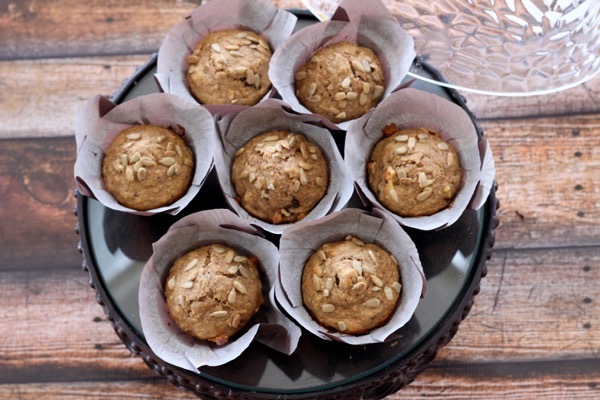 These naturally sweetened, whole grain muffins are moist, delicious and kid approved! Preheat the oven to 375 degrees F and line a regular size muffin pan with muffin cups/liners. Mix together the wheat bran and yogurt in a small bowl and set aside. In a large mixing bowl use a hand blender to blend together the eggs, coconut oil, maple syrup, honey, mashed bananas and lemon juice. Add the raisins and the wheat bran-yogurt mixture and mix well. In another bowl, gently mix the pastry flour, wheat germ, baking power, baking soda, cinnamon and nutmeg. Add the flour mixture to the bowl of wet ingredients and mix with a large spoon, just until combined. If you’d like to add any additional mix-ins, fold them in now. Divide the batter evenly between the ten muffin cups and sprinkle the tops of the muffins with a small amount of sunflower seeds, a piece of walnut, oats or any other desired topping. Bake the muffins for 20 minutes, or until a golden hue and a toothpick inserted into a muffin comes out clean. Place the muffin tin on a cooling rack and enjoy!